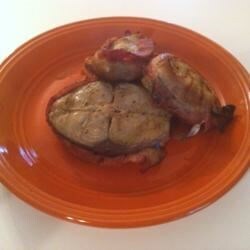 "I don't like fish with dark meat, but I loved this recipe. My fishing guide gave it to me. Hope you like it. Kingfish is also known as King Mackerel." Cover fish with water, refrigerate and let stand for 2 days. Change water every six hours. Two to twelve hours before fish is to be cooked, drain water and cover fish with salad dressing. Heat a grill to medium heat. Remove fish from marinade and place skin side down on grill. Cook until meat is tender and flaky, about 20 minutes. Definitely not my thing and I used fish that I had caught hours before so it was guaranteed fresh. This is a delicious recipe and so easy. I have cooked far more elaborate recipes for fish that weren't as tasty. A real keeper. If you really want to bleach out a King Fish soak the fillets in lemon juice and salt with enough water to cover completely over night. This gives you very white fish with a lemon taste. Did it after being frozen for a couple of months. Used a raspberry Italian, and it added a fantastic touch of sweetness!